The WW2 Firefly tanks were produced on three hulls: the Mk Ic hybrid, the Mk Ic welded hull and the Mk V. I don’t have the numbers of each variant, but judging by the available photos, the most numerous Mark looks to be the Mk V, while apparently the silver medal went to the hybrid. Despite this, currently there are no less than three Mk Ic welded plastic kits on the market (and no hybrid one): Dragon, Extratech and Armourfast. The type chosen by Extratech is a late ALCO/Pullman M4 with the pistol port turret, as did Dragon. For the layman, the M4 medium tank, aka Sherman Mk I (welded hull), was built by four factories each having several different details. I found photos of just 31 Fireflies Mk I welded tanks (almost all taken in NWE) and analysing them gave me the following results: 16 were certainly late production Baldwin tanks while 8 undoubtedly were ALCO/Pullman tanks. Of these, 3 had a rounded cast transmission cover and only 2 had the pistol port turrets, as offered by Extratech. A look at the WD numbers indicates they were taken randomly from these batches: T231626 - T233625, T261894 - T263893, T269094 - T271093 and T331350 - T331699. The WD numbers don’t help to make a distinction between variants because they look to be assigned generally to Sherman tanks and not to specific production plants or batches. As for others kits, the Extratech kit also looks to be great at first glance. In the box there are four dark grey plastic mouldings, a single resin piece, a PE fret, the decal set and the instructions. 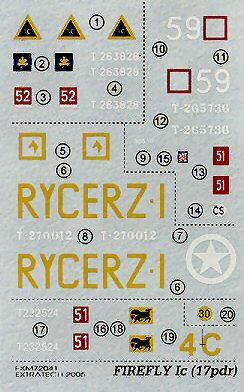 You get a lot of parts and several of them will find themselves in your spare parts reserve, because the sprues are shared by the M10 and the M4A3 kits. Anyway, after closer examination of the parts, some details tell us another story. The antenna bracket is conical and the upper hull rear plate is too sloped, shortening the engine deck. 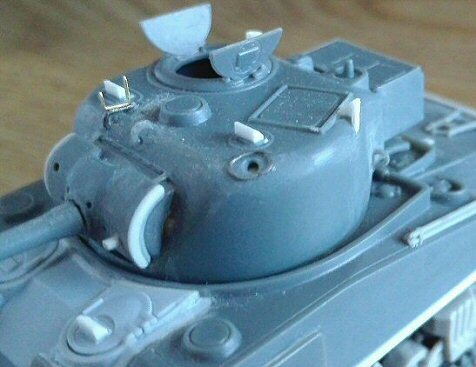 The hull belly layout is quite correct for a M4A2 (Sherman III) or a M10. The bogies, although each one reproduced by eight (!) parts give a good rendition of the original only if seen from the side (if the skids are drilled open), while from a forward and backward position they are too wide. The mantlet is a bit narrow and so on. Some details are shallow and need to be raised or enhanced during painting. The instructions are on an 8 pages booklet. The painting drawings show each tank proposed on the (good) decal sheet as an ALCO/Pullman vehicle with pistol port turrets. They weren’t (see below). I usually don’t care about the box images; anyway the tank depicted on the Extratech box wrongly has the bolted transmission cover. 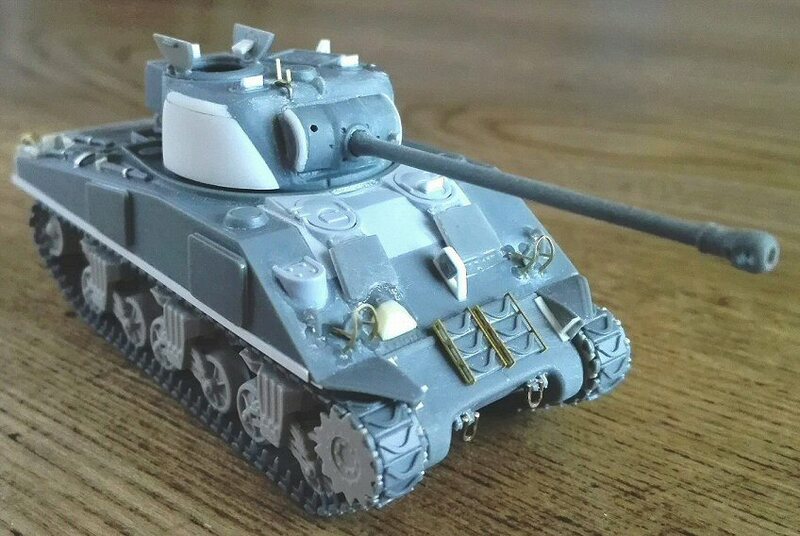 I chose to make a Firefly Mk I welded based on a Baldwin Sherman. Specific production plant differences, apart from the other corrections are shared by the ALCO/Pullman variant. Some very useful sources I used are the Hunnicut book and the dedicated Sherman site . The turret and the hull don’t have an interlock. If not glued on properly, they can come undone at a bad moment. I made an interlock with plastic pieces glued to the turret base while filing the housing on the hull ring. The M34A1 gun mount (late) has the flange moulded on the turret, but also on the sides! To restore the correct layout, I erased the flange on the sides and on the left one (we are in the tank looking forward) I added a little bulge. On the curved surface the vertical reliefs are too shallow. I made these with stretched sprue. The Firefly mantlet is a bit narrow. The mount was of the late type and the mantlet sides should slightly overhang the mount sides. With plastic and stretched sprue I widened it and made the inner rim. The gun end needs to be drilled open. As far as I’ve seen on my photos, most of the Firefly Ic welded had a turret without a pistol port. This mean I had to add cast-in additional armour instead of the welded type suggested by the kit. Luckily the pistol port is separate part on the sprue, so I didn’t have to file it off (two other pieces for the spare parts box). The radio box was welded to the bustle with huge seams. I made them with acrylic glue. Its position is a bit high and to avoid a slot I shimmed the upper edge front inside with plastic. The hatch ring is missing the MG support. I made it with plastic rod segment drilled open. The loader hatch had a stop just behind the hinge. I made it with thin plastic sheet. 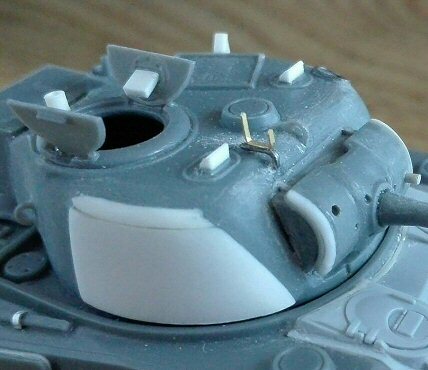 The Firefly has a smoke mortar on the turret with an oval ring around it, just like other British tanks. Installing the mortar was part of the Firefly conversion job. Since Extratech doesn't give you one, I drilled a hole myself. Around it I glued the ring made with metallic wire wrapped around a template. The periscopes are in the closed position. I opened them with triangular plastic rod segments. On the late M4 the aiming blade was replaced by a device on the left side of the periscope. I did scratchbuilt it with a shaped staple and a piece of the PE fret support cut off, rounded at the ends and folded in shape. The belly has the M4A2/M10 layout. I sanded down every detail and I added the two plates and the transversal rods for a M4/M4A1 belly layout. The sloped belly of the transmission cover is too short. I filed it to the correct shape. The upper edge was a cast bullet splash, to protect the bolt heads. I softened it with glue and sand paper. The lower sponson ends are a bit large. I filed them inside to get the correct lower hull width. The transition plate in the kit is correct if building an ALCO tank. Since I want a Baldwin one, I rounded it with a thin sprue segment. The plates H15 are much too thick, I thinned them but they can be replaced with plastic sheet quite easily. The bottoms of the air filters (which strangely enough are depicted upside down in the instructions) weren't shaped as a horse shoe, it was rounded. So, I filed away the wrong section and replaced it with some punched plastic sheet. As far as I’ve seen, they were placed vertically, not parallel to the rear plate. I glued them in the correct position using hidden sprue segments to keep them firmly in place. The towing hook B5 is very simplified. However, Fireflies didn’t seem to use it and sometimes there was only the plate where it was bolted on. I made this plate with plastic sheet. The track tensioners are much too wide and miss the bolt heads. I shortened them and added a round rod segment (I don’t have a hexagonal rod). The idler support plates B6/B11 are much too thick, while the details are too shallow. I thinned them and the rounded plate, where the idler have to be glued on, was made with plastic sheet. The glacis additional armour plates are a millimetre too high. I filed them from above: being trapezoidal and not rectangular filing from below means reducing their width (which is already a little short). I made the four shackles with metallic wire. A nice detail often forgotten by the kit makers. I replaced the hoods. They are well done, but the Baldwin tanks had always the direct vision slots. The hatch periscopes are in the closed position in both kits (Extratech and Heller). I opened the driver's one with a triangular plastic rod segment. I also replaced the glacis antenna bracket. For my Baldwin tank, I used a “D” fabricated type, but I’d replace it also if I chose to make an ALCO tank. The conical type suggested by Extratech isn’t strictly wrong; simply it was used by the Federal Machine & Welder M4A2, the Ford M4A3 and the Chrysler M4A4. Heller provided the antenna bracket from its M4 kit spare parts; anyway scratchbuilding it is not so hard. The fenders need a little adjustment to be glued in place. As usual their supporting structure is missing. I made it with plastic strips. In the photos I’ve seen the horn wasn’t always present and when installed, it was of the second type: placed on the glacis near the driver hood with the brush guard (sometime the guard is empty). I made it with plastic strips and a spare horn. The rear plate is moulded at an angle that is too much sloped, making the deck a millimetre shorter. Having to correct it to the vertical position for a Baldwin tank, I replaced it after having filed the sides and filled the gap at the rear deck with plastic (dark green on the image). For an ALCO tank I’d cut off the rear plate and place it on a shimmed rear hull shaped to the correct angle. The deck plate’s lines are engraved only longitudinally while the two transversal lines are raised. After engraving them, I lost the hinges, which however are moulded outside their position, so I fabricated them with plastic sheet and stretched sprue. I glued the exhausts where the deck meets the rear plate. 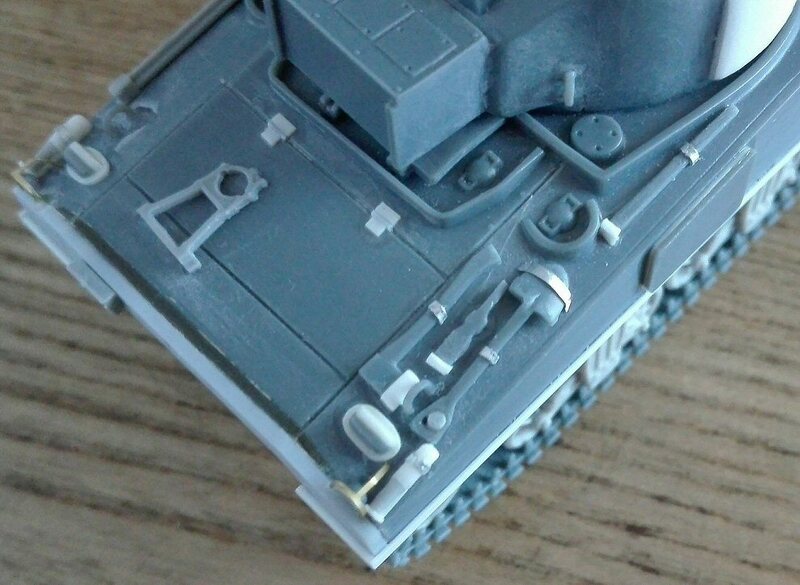 They are incorrectly shown in the instruction like the M4A3 models, but they were different. Their ends face the ground, while the pipes run horizontally along under the deck. The instructions places the rear lifting hooks too much on the outside. I glued the right one after having glued the tools and then I copied that position on the left side. If placed on the place suggested will be no room for the shovel handle, best check with a photo. On the sides of the rear deck, there are the two grouser’s oval wells. Their caps are undersized. I carefully shaved them off to ease my sanding job on the rear edge and I glued them back on after making them bigger with plastic sheet, but their scratch building is quite easy. Next to these, you should have the fire extinguishers. Missing in this kit I made them with plastic rods and stretched sprue. The gun cleaning rods which are carried on the left side are not included in the kit. I used the Dragon ones, but it’s very simple to make them yourself with stretched sprue. The typical Firefly hinged gun travelling lock on the rear deck is also which is missing in this kit. However, Extratech instead proposes the same gun lock used on late Sherman models (the 47° glacis 75mm, 76mm and 105mm variants and the very late M4A1 75mm) which was very different. I replaced it with one taken from the spare box, a leftover from the M4 Dragon. The same source also gave me the telephone/first aid box, another piece missing in the kit. It was fixed on the rear plate. Interestingly, the US tools fastened on this plate were removed by the British in every photo show it. About the tools, they are certainly well made. But they are moulded as they were free and not fixed somehow. I added the fasteners with thin metallic strips and the holders with shaped plastic pieces. The additional side armour plates are quite correct, but look thin when dry fitted, so I gave them some body with thin plastic sheet. I added the sandshields supports with plastic strip. Being the sandshields length standard, the rear strips must to be thicker than the side ones. The bogies have a too much “rectangular” section, the skids are solid and the arms are not well defined. The pressed wheels have the spokes too wide and rough and the open spokes wheels needs to be softened on the edges and are missing a the rim. I replaced the bogies with surplus parts given in the Trumpeter M4A1 76mm. Being solid, I emptied the bogies with a motor tool and a blade. With sprue sections I replaced the oversized upper little rolls and the vertical volute springs to fill the bogies. The sprockets are well done but they have the little spokes not used in the tanks which I have on photos. Unfortunately the ways they are attached to the sprue make it easy to damage the tooth shape during cleaning. I replace them with the plain type from a Sherman Trumpeter kit. Also the idlers were replaced from the ones taken from that same set. The link and length tracks suggested are a mid way between the T62 type (minus the bolt heads) and the T54E2 (minus the side cuts). They are well done and interlocks with each other very well. Most of the Firefly I welded I’ve seen had the metallic T54E1/T74 or the rubber T48. A couple had the flat T51 and three had the T54E2 as "almost" suggested by the kit. 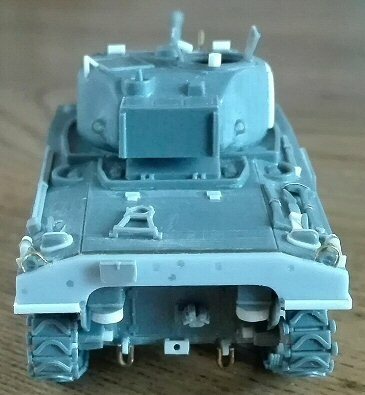 As far as I’ve seen on the Sherman tanks in Normandy, these tracks weren’t used by the US M4 while they are present on the 33rd Armd Bde Sherman Mk I; having said this, after considering their replacement, I chose to use them to give my Firefly a more British look. Anyway the curved relief on the pad shoe can be erased quite easily to obtain the flat rubber type. T263828, the Fort Garry Horse, 2nd Canadian Armd Bde, Netherlands 1945. I didn’t’ find a photo of this particular vehicle. I’ve seen three photo of FGH Firefly Ic and two were Baldwin tanks. T270012, 2nd Polish Armd Bde, 2nd Armd Div, Italy 1945. It was an ALCO/Pullman tank with cast hoods, turret without pistol port, pressed wheels and T54E1 or T74 tracks. T265736, 1st Czechoslovak Armd Btn, France 1944. It was an ALCO/Pullman tank with cast hoods, no pistol port, spoke wheels and T54E1 tracks. The WD number begun with 269, not 265. T232524, 23rd Hussars, 29th Armd Bde, 11th Armd Div, France 1944. It was a Baldwin tank with Direct Vision hoods, no pistol port on the turret, pressed wheels and T51 tracks. In my photo the WD numbers are not very visible, but T232624 or T232634 seems to be correct. The kit is a quite a good base; anyway it needs a lot of improvements even if you make the ALCO/Pullman variant suggested by Extratech. 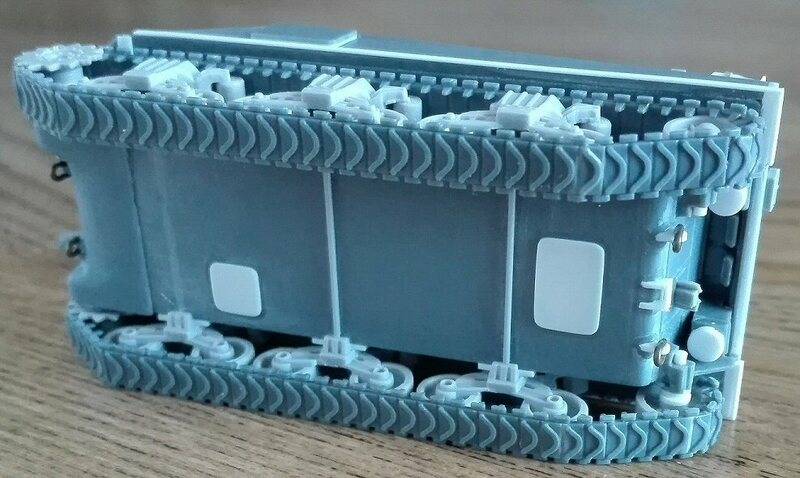 With improvements the kit looks good while if made OOTB the only really wrong parts are the upper hull rear plate (a thing which could be easily solved) and the bogies set (less easy to solve, replacing them is better in my opinion). The spokes wheels are unusable if not reworked; the pressed ones could be used if dirtied by some covering mud. Some specific parts are missing (gunlock, telephone box…). The tracks are interesting; they can be swapped and used on another Commonwealth Sherman variant which had this type, such as the Mk V, the 4th Armd Bde Mk II or the 33rd Armd Bde Mk I. Currently the availability of Fireflies kits is disappointing (with no one making a hybrid one) and Extratech seems to be out of production. To have a Mk I welded, one solution is to mate a Firefly kit (Armourfast Mk I, UM Mk V or PSC Mk V) with a good M4 kit. Despite its faults, this is still an interesting kit which can be used to have a Firefly hybrid by conversion, mating it with a large hatch M4A1 upper hull front. P.S. : most of the improvement described applies also to the Extratech M4 kit, with only another turret sprue and PE fret.